^ "Uppies and Downies website". Retrieved 25 June 2009. Barrow-in-Furness, commonly known as Barrow, is a town and borough in Cumbria, England. Historically part of Lancashire, it was incorporated as a municipal borough in 1867 and merged with Dalton-in-Furness Urban District in 1974 to form the Borough of Barrow-in-Furness. At the tip of the Furness peninsula, close to the Lake District, it is bordered by Morecambe Bay, the Duddon Estuary and the Irish Sea. In 2011, Barrow's population was 57,000, making it the second largest urban area in Cumbria after Carlisle, although it is geographically closer to the whole of Lancashire and most of Merseyside. Natives of Barrow, as well as the local dialect, are known as Barrovian.In the Middle Ages, Barrow was a small hamlet within the Parish of Dalton-in-Furness with Furness Abbey, now on the outskirts of the modern-day town, controlling the local economy before its dissolution in 1537. The iron prospector Henry Schneider arrived in Furness in 1839 and, with other investors, opened the Furness Railway in 1846 to transport iron ore and slate from local mines to the coast. Further hematite deposits were discovered, of sufficient size to develop factories for smelting and exporting steel. For a period of the late 19th century, the Barrow Hematite Steel Company-owned steelworks was the world's largest.Barrow's location and the availability of steel allowed the town to develop into a significant producer of naval vessels, a shift that was accelerated during World War I and the local yard's specialisation in submarines. The original iron- and steel-making enterprises closed down after World War II, leaving Vickers shipyard as Barrow's main industry and employer. Several Royal Navy flagships, the vast majority of its nuclear submarines as well as numerous other naval vessels, ocean liners and oil tankers have been manufactured at the facility. The end of the Cold War and subsequent decrease in military spending saw high unemployment in the town through lack of contracts; despite this, the BAE Systems shipyard remains operational as the UK's largest by workforce and is undergoing a major expansion associated with the Dreadnought-class submarine programme. Today Barrow is a hub for energy generation and handling. Offshore wind farms form one of the highest concentrations of turbines in the world, including the single largest with multiple operating bases in Barrow. Carlisle ( or locally from Cumbric: Caer Luel Scottish Gaelic: Cathair Luail) is a historic city and the county town of Cumbria. 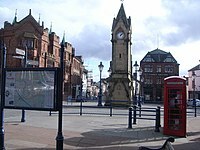 Historically in Cumberland, it is also the administrative centre of the City of Carlisle district in North West England. Carlisle is located at the confluence of the rivers Eden, Caldew and Petteril, 10 miles (16 km) south of the Scottish border. It is the largest settlement in the county of Cumbria, and serves as the administrative centre for both Carlisle City Council and Cumbria County Council. At the time of the 2001 census, the population of Carlisle was 71,773, with 100,734 living in the wider city. Ten years later, at the 2011 census, the city's population had risen to 75,306, with 107,524 in the wider city.The early history of Carlisle is marked by its status as a Roman settlement, established to serve the forts on Hadrian's Wall. During the Middle Ages, because of its proximity to the Kingdom of Scotland, Carlisle became an important military stronghold; Carlisle Castle, still relatively intact, was built in 1092 by William Rufus, and once served as a prison for Mary, Queen of Scots. The castle now houses the Duke of Lancaster's Regiment and the Border Regiment Museum. In the early 12th century, Henry I allowed the foundation of a priory in Carlisle. The town gained the status of a city when its diocese was formed in 1133, and the priory became Carlisle Cathedral. Cumbria 1 (formerly Cumbria League) is a competitive rugby union league at tier 7 of the English rugby union system run by the English Rugby Football Union for club sides based in Cumbria. Promoted teams typically go up to North 1 West while relegated sides drop to Cumbria 2. Each season a team from Cumbria 1 is picked to take part in the RFU Intermediate Cup - a national competition for clubs at level 7. Up until the end of the 2017-18 season the Cumbria League was a single division involving 10 clubs and ranked at tier 8 of the English rugby union system. The champions were automatically promoted to the now discontinued North Lancashire/Cumbria league and up until the 2016-17 season the second placed team faced the runner up from Lancashire (North) for the final promotion place until Lancashire (North) was cancelled. There was no relegation due to it having been the lowest competitive league for Rugby Union in Cumbria. It ran alongside the Cumbria 2 North & West and Cumbria 2 South & East Merit Leagues.This changed for the 2018-19 season due to RFU having to restructuring the northern leagues after 19 Lancashire based clubs withdrew from the league system to form their own competition. The result was that the Cumbrian clubs based in North Lancashire/Cumbria joined the top 3 Cumbria League sides in Cumbria 1, while the rest of the Cumbrian League sides along with a handful of 2nd XV teams formed Cumbria 2.Another change to the structure from the 2018-19 season was that the division would play two stages - the first involving all eight teams to decide who would be contesting promotion and relegation during the second stage when the division was divided into two mini leagues (one promotion/one relegation). Cumbria 2 is a competitive rugby union league at tier 8 of the English rugby union system run by the English Rugby Football Union for club sides based in Cumbria. Teams are promoted to Cumbria 1 and as it is the lowest ranked RFU league in the county there is no relegation. Each season a team from Cumbria 2 is picked to take part in the RFU Senior Vase - a national competition for clubs at level 8. Cumbria 2 was formed for the 2018-19 season when the RFU had to restructure the Cumbria and northern leagues due to 19 Lancashire based clubs withdrawing from the league structure to form their own competition. A consequence of this was that North Lancashire/Cumbria was cancelled and the Cumbria League was split into two divisions, with the North Lancashire/Cumbria clubs joining the top 3 Cumbria League clubs in Cumbria 1, and the rest of the sides (including some 2nd XV teams) forming Cumbria 2. Cumbria Constabulary is the territorial police force in England covering Cumbria. As of September 2017, the force had 1,108 police officers, 535 police staff, 93 police community support officers, 25 designated officers and 86 special constables. In terms of officer numbers, it is the 7th smallest of the 48 police forces of the United Kingdom. Conversely, its geographic area of responsibility is the 7th largest police area of a territorial police force in the United Kingdom (when including Police Scotland and the Police Service of Northern Ireland). The force area's size and its population of just under 500,000 people makes it sparsely populated. The only major urban areas are Carlisle and Barrow-in-Furness. There are significant areas of isolated and rural community, and the county has one of the smallest visible minority ethnic populations in the country at under 3.0%. Each year Cumbria, which incorporates the Lake District National Park, attracts over 23 million visitors from all over the world (46 times the local population). The county has 67 miles (108 km) of motorway and some 700 miles (1,100 km) of trunk and primary roads. The Chief Constable is Michelle Skeer. The headquarters of the force are at Carleton Hall, Penrith. Cumbria Fire and Rescue Service is the statutory fire and rescue service for the Shire county of Cumbria, England. Of the 38 fire stations, there are six wholetime (Barrow-in-Furness, Carlisle (2 Stations East and West), Whitehaven, Workington and Ulverston). 2-day crewed (Kendal and Penrith) and 30 retained. Since 2012 the headquarters are at Penrith next to the headquarters of Cumbria Constabulary. The Cumbria Rugby Union is the governing body for the sport of rugby union in the county of Cumbria in England. The union is the constituent body of the Rugby Football Union (RFU) for Cumbria, and administers and organises rugby union clubs and competitions in the county. It also administers the Cumbria rugby representative teams. The county of Cumbria is divided into six districts. The districts of Cumbria are Borough of Barrow-in-Furness, District of South Lakeland, Borough of Copeland, Borough of Allerdale, District of Eden, City of Carlisle. As there are 460 Grade II* listed buildings in the county they have been split into separate lists for each district. Map of villages in Cumbria compiled from this listThis is a list of cities, towns and villages in the county of Cumbria, England. See the list of places in England for places in other counties. Penrith ( pen-RITH) is a market town and civil parish in the county of Cumbria, England. Penrith lies less than 3 miles (5 km) outside the boundaries of the Lake District National Park. Historically a part of Cumberland, Penrith's local authority is currently Eden District Council, which is based in the town. Penrith was formerly the seat of both Penrith Urban and Rural District Councils. From 1974 to 2015, Penrith had no town council of its own, and was an unparished area. A civil parish of Penrith was recreated in 2015. Penrith Town Council was formed in 2015 and the first elections to the council took place on May 7, 2015. Ulverston is a market town in the South Lakeland district of Cumbria in North West England. Historically in Lancashire, the town is in the Furness area eight miles (13 km) north-east of Barrow-in-Furness and four miles (7 km) south of the Lake District. It is just to the northwest of Morecambe Bay. Neighbouring settlements include Swarthmoor, Pennington and Rosside. Ulverston's most visible landmark is Hoad Monument, a concrete structure built in 1850 to commemorate statesman and local resident Sir John Barrow. The monument provides views of the surrounding area, including Morecambe Bay and parts of the Lake District. Ulverston Canal, no longer navigable, was once a vital component of the town's economy and is still celebrated with an art installation. The University of Cumbria is a public university in Cumbria, with its headquarters in Carlisle and other major campuses in Lancaster, Ambleside, and London. It opened its doors in 2007, and has roots extending back to the Society for the Encouragement of Fine Arts, established in 1822, and the teacher training college established by Charlotte Mason in the 1890s. Westmorland (; formerly also spelt Westmoreland; even older spellings are Westmerland and Westmereland) is a historic county in north west England. It formed an administrative county between 1889 and 1974, after which the whole county was administered by the new administrative county of Cumbria. In 2013, the Secretary of State for Communities and Local Government, Eric Pickles, formally recognised and acknowledged the continued existence of England's 39 historic counties, including Westmorland. Windermere is a town and civil parish in the South Lakeland District of Cumbria, England. It has a population of 8,245 increasing to 8,359 at the 2011 Census, and lies about half a mile (1 km) away from the lake, Windermere. Although the town Windermere does not touch the lake (it took the name of the lake when the railway line was built in 1847 and the station was called "Windermere"), it has now grown together with the older lakeside town of Bowness-on-Windermere, though the two retain distinguishable town centres. Tourism is popular in the town owing to its proximity to the lake and local scenery. Boats from the piers in Bowness sail around the lake, many calling at Ambleside or at Lakeside where there is a restored railway. Windermere Hotel opened at the same time as the railway. Workington is a coastal town and civil parish at the mouth of the River Derwent on the west coast of Cumbria, England. Historically in Cumberland and lying in the Borough of Allerdale, Workington is 32 miles (51.5 km) southwest of Carlisle, 7 miles (11.3 km) west of Cockermouth, and 5 miles (8.0 km) southwest of Maryport. At the 2011 Census it had a population of 25,207.Workington is the seat of Allerdale Borough Council, which holds the Allerdale Borough Council elections. Sue Hayman is the MP for the constituency of the same name that includes other towns in Workington's hinterland.